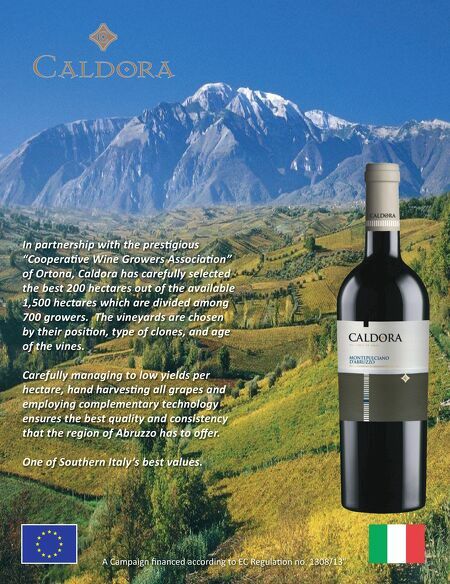 In partnership with the pres gious "Coopera ve Wine Growers Associa on" of Ortona, Caldora has carefully selected the best 200 hectares out of the available 1,500 hectares which are divided among 700 growers. The vineyards are chosen by their posi on, type of clones, and age of the vines. Carefully managing to low yields per hectare, hand harves ng all grapes and employing complementary technology ensures the best quality and consistency that the region of Abruzzo has to off er. One of Southern Italy's best values. A Campaign fi nanced according to EC Regula on no. 1308/13"